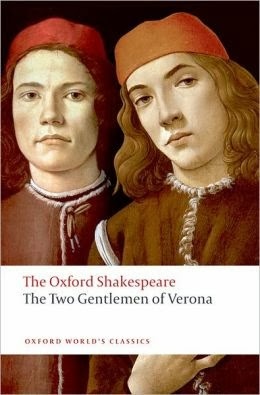 Academic squabbling and gauntlet-tossing over content and form aside, The Two Gentlemen of Verona stands as one of the earliest recorded attempts at the comedic form we have from the Shake. We see here many of the themes and plot devices that will surface again and again throughout the man’s body of comedic work, such as women disguising themselves as male pages, rings symbolizing fealty, bros rivaling over who has first dibs on the hottest of the hoes, lamebrain suitors, servants whose speech are littered with malapropisms (yet more often than not they’re the only ones spouting out anything closely-resembling wisdom), social structures being flung out the window once you leave the comfort of the castle and go out into the wilds of Italy’s forests, and a nice and neat ending with the necessary bombardment of marriages. This play is certainly clumsy and ridiculously implausible in places, but still it ends up being a satisfying and fun bit of witty merriment for any self-proclaimed lover of the Shake. Loved the Outlaws of Love who pop up in the last two acts to help facilitate the pulling of heads out of respective asses, and also Launce’s touching and funny soliloquy about his dog, Crab, which oddly enough is the closest thing to a genuine display of love and devotion found anywhere in this play about bratty and over-privileged rich kids and their feelings.